Australia’s Michael Booth has officially ditched his “dark horse” label, winning the long distance race here in St. Maxime, France with a commanding performance that saw him finish a minute clear of Connor Baxter, Titouan Puyo and Steeve Teihotaata. Despite the relatively calm conditions on the opening stretch – there were 23 guys in the lead draft train at one point – the Starboard rider flexed his muscles and used his raw power to pull away from the all-star lineup of athletes that had been sitting on his tail. 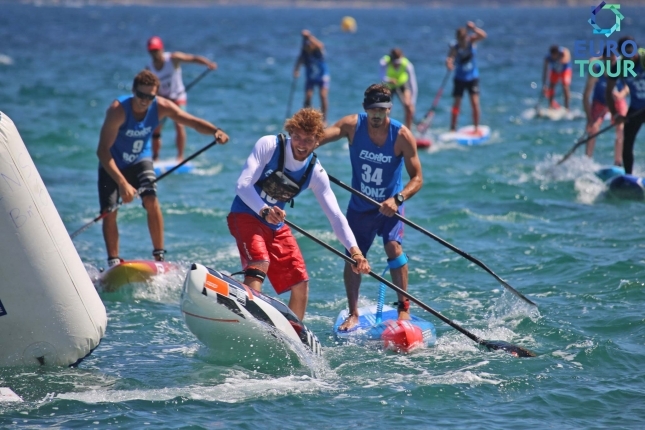 Boothy broke the elite field at around the 4km mark and paddled for more than an hour on his own to claim a memorable victory, though Connor managed to narrowly hold on to the overall event title (based on combined times from Day 1 and Day 2) to claim Week 3 of the 2016 EuroTour presented by Starboard. Sonni Hönscheid made it a clean sweep of the women’s event after seeing off challenges from the likes of Fiona Wylde, Olivia Piana and Seychelle Hattingh over the 15km distance race, mirroring her victory in Saturday’s course race. Shortly after Boothy attacked the field – in a style reminiscent of a solo rider going for broke up the Alpe d’Huez in the Tour de France – Titou, Connor and Steeve broke free from the other top 10 contenders and began working as a three-man chase group. However Boothy’s gap simply kept growing, expanding to about one minute at the 10km mark — a margin that would stay in place all the way to the finish. The chase trio worked hard but Boothy was on another level out there. Connor mentioned post-race how he thought they would eventually, inevitably catch the Aussie, but once he was gone Boothy never looked back. 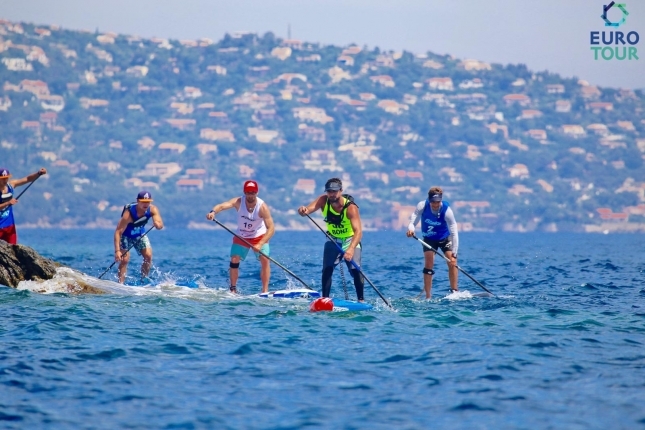 All of the Aussie viewers on our Starboard Live Stream started showing their excitement went Boothy attacked, with several of his family, friends and fellow top Aussie paddlers leaving shout outs of support and encouragement as he charged around the course to the backdrop of the beautiful French Riviera. At one point some of the lads even started laying bets — Jayden Jensen asked to put $1,000 on Boothy to hold his lead the whole way home. You can watch a full replay of the Starboard Live Stream below (click here to skip straight to it). It was great to see so many paddling fans around the world not only tuning in but getting involved in the broadcast by leaving comments and chatting back-and-forth with the other guys and girls on the Facebook stream; We plan to bring you another live stream from the big Lost Mills showdown next weekend (mobile internet permitting). 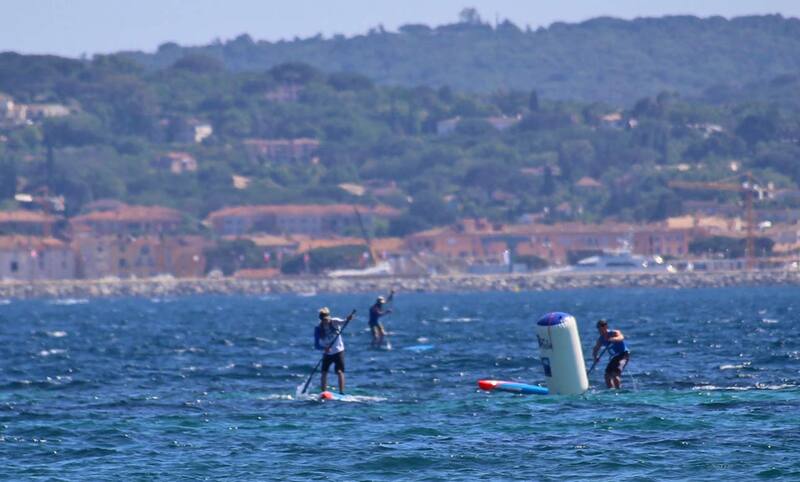 With a moderate breeze creating small bumps on the more exposed parts of this stunning long distance course, the mid-packs quickly broke up into groups of four or five, which put big time gaps between the guys battling for the overall top 10; The SUP Race Cup here in St. Maxime is based on combined times from Saturday’s course race and Sunday’s distance race. As Boothy paddled clear, the real fight was happening behind him, with Connor having to defend the 66 second lead he built up over his team mate on Saturday. Titou was also still in contention, having finished just 9 seconds behind Connor and almost a minute ahead of Boothy on Saturday. This meant there were three guys in contention for the overall event title right until the finish. Indeed, Boothy wasn’t sure exactly where he’d finished after triumphantly crossing the line; Flanked by his girlfriend who had the stopwatch going, the Aussie had a nervous wait for the next minute to see where Connor and Titou would finish. In the end, Connor pulled away from Titou and Steeve to finish 57 seconds adrift, which gave him a narrow victory based on combined times. Titou was only about 10 board lengths behind Connor at the end, but that was just enough to bump the NSP/Quickblade team rider and hero of last month’s Carolina Cup down to third on the overall standings. While it was Boothy’s day today, it was Connor’s weekend. The world number one put in his signature strong performance yesterday to win the course race, and did just enough to defend his lead today. Speaking of defense; Connor is the defending EuroTour champion, and now takes an early lead on the 2016 leaderboard. The Maui superstar’s status in the sport continues to grow. Take a look at the updated SUP Racer World Rankings, with Michael Booth jumping +18 spots to sneak inside the world’s top 20 for the first time (and he’ll only keep rising from here). The Hasulyo Brothers, Daniel and Bruno, were the other big movers this week. On the women’s Top 50 leaderboard, Sonni Hönscheid overtakes Fiona Wylde as the new world number three, while Seychelle Hattingh and Olivia Piana made big moves north. Titou looked strong all race and showed he’ll be a contender for the EuroTour crown, however the Starboard duo of Boothy and Connor have the jump on him after the first of three “Headline” events that will largely determine the final EuroTour leaderboard standings (the next two being the Lost Mills and Bilbao). The New Caledonian looked strong early and aggressively tried to close the gap on Boothy, but as Titou said in our post-race interview (which you can watch below), Boothy was just too fast today. Titou also had a brief scare in the early stages of the race, when he paddled over a piece of plastic that got stuck on his fin and instantly slowed him down. But in a move that would have made a Formula 1 pit crew proud, Titou got down on his knees, scurried to the back of his board, cleared the debris, stood up and rocketed back to the front in a matter of seconds. Also impressing today today was Steeve Teihotaata, the Mistral team rider from Tahiti that defeated Titou at the big Air France Paddle Festival back home just one week ago. After a poor finish in Saturday’s course race, where the tight, technical course stopped him from spreading his wings, the Tahitian dark horse and 11 City Tour champion was feeling right at home in the open expanses of the distance race. The ever-smiling, always-stoked Tahitian worked hard with Connor and Titou to chase Boothy and hold off the third group, commenting post-race that he was happy with his performance and excited to be racing these guys again at the Lost Mills next weekend. Crossing the line about a minute behind Steeve was Daniel Hasulyo, who was soon followed by his brother Bruno. The Hasulyo Brothers worked alongside Trevor Tunnington, Martin Letourneur and Leo Nika for much of the race, which ensured they narrowly maintained top five spots for the overall results; Daniel finished 4th overall while Bruno was 5th, just ahead of Steeve. It was yet another strong performance by these two rising stars from Hungary. Trevor and Martin were impressive and paddled hard all the way round the 15km course, while Leo was sitting at the front of the field early but faded in the final kilometre to finish 9th. Others to impress included Italy’s Paolo Marconi, who scored an overall top 10 result to go with his EuroTour victory on Mallorca last week, as well as his compatriot Martino Rogai. The Italians are really coming on strong, with more than half a dozen guys that wouldn’t feel out of place at any top level international race. Also paddling strong today were the Teulade Brothers from France, Jeremy and Ludovic, hunting in the same pack as Beau O’Brian, who was in contention early but faded outside the top 10 in the second half. Eric Terrien put in another workmanlike performance over the 15km distance race to show he’s still got some fire in his belly. Over in the women’s race, Sonni Hönscheid was once again too strong in the distance event, matching her runaway victory in Saturday’s course race to claim a triumphant overall title here in St. Maxime. The women’s race was tight early, with Sonni having to work through the field as the likes of Olivia Piana, Fiona Wylde and Seychelle Hattingh got a fast start. But the powerful German soon moved to the front, and by the 7km mark had broken the rest of the ladies to paddle the final 8kms on her own. 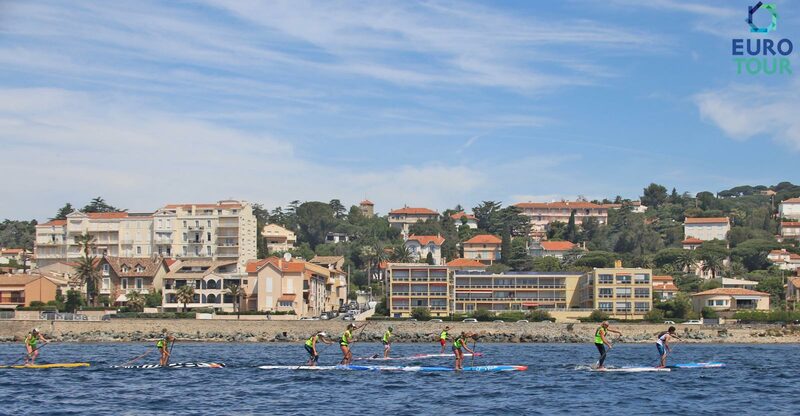 Sonni is on a fantastic winning streak right now, having saluted in four events over the past four weekends: OluKai, Paddle Imua, Port Adriano and now the SUP Race Cup here in France. The SIC team rider heads to the Lost Mills full of confidence and in a good position to defend her EuroTour crown. Fiona was impressive for the second day in a row, as was her Starboard team mate Olivia, who has made a successful comeback to the sport after taking a season off. Though one of most impressive contenders today was Seychelle Hattingh, who, just like her Mistral team mate Steeve, thoroughly enjoyed the longer, more wide open course to make up plenty of time after finishing mid-pack in Saturday’s tight course race. In a mirror of the men’s race, Seychelle, Fiona and Olivia worked in a group of three to chase the breakaway leader Sonni, however they could never close the gap and were left in a fight for the minor placings. Seychelle, who holds the official 24 hour distance paddling world record, pulled clear in the final kilometre to cross about half a minute in front of Fiona, with an impressive Olivia a similar distance behind in 4th place. The Floridian’s runner-up result today boosted her up to the overall top four, with the final standings being Sonni, Fiona, Olivia, Seychelle and April Zilg, who rounded out the top five after showing great form across the weekend. April is traveling on the EuroTour with her fellow American and Hobie team mate, 14-year-old Lexi Alston, who herself put in another mature performance that showed talent well beyond her years. Definitely a name to watch in the future. Also racing well all weekend was Susak Molinero, the RRD team rider from Spain that lives and trains in Italy with boyfriend and fellow top 10 finisher Paolo Marconi. Susak was one of the revelations on last year’s EuroTour and looks set for another big summer over the next couple of months. There were a couple of retirements from top contenders today, with Jake Jensen withdrawing due to extreme fatigue after just 1km, while French hope Celine Guesdon also ended with a DNF next to her name. On Saturday, Manca Notar failed to finish the course race after suffering severe cramps and headaches and was unfortunately unable to take part in Sunday’s distance event. 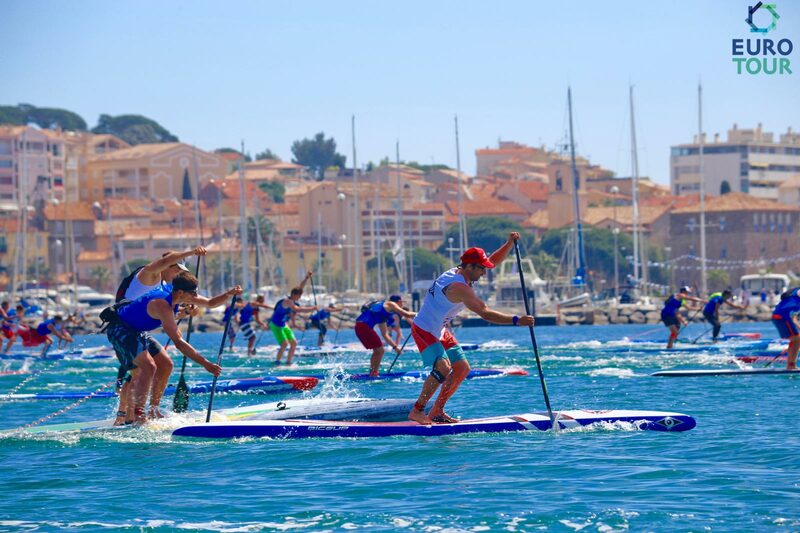 It was a great weekend of racing here in St. Maxime, with the beautiful backdrop of the sun-soaked French Riviera providing an amazing setting. HUGE shout out to the local La Cigale Surf Club, led by event director Yannick Pinaud, who did a great job organising the 7th annual edition of this classic event. Big thanks also to the EuroTour organisers and Starboard for making our live stream possible. The EuroTour crew will now hop in their van and drive the massive board trailer north to Germany; There are about 45 boards stacked in there, with all EuroTour athletes getting free board transport between each event (which is a godsend). The 2016 EuroTour continues into Week 4 with the “Battle of Bavaria” at the big Lost Mills race in Germany. After so many strong performances from the international and European athletes this weekend, next week is shaping up to be a mammoth showdown, especially with half a dozen more top ranked internationals flying in. We’ll try and bring you another Facebook Live stream from Germany, though it’ll depend on the internet coverage. In the meantime, here’s our live stream replay from Sunday plus other race videos and full results. Scroll down for the recap from Day 1. Thanks to everyone that tuned in to the live stream and sent hundreds of great comments that really gave it a fun community vibe. Apologies for the feed cutting out before the end… We’ll try and get another stream happening for the Lost Mills race next Saturday. Connor Baxter and Sonni Hönscheid have drawn first blood here at the SUP Race Cup, taking out the course race on Day 1 ahead of an elite field, as Week 3 of the 2016 EuroTour presented by Starboard got underway under sunny skies here in St. Maxime, France. 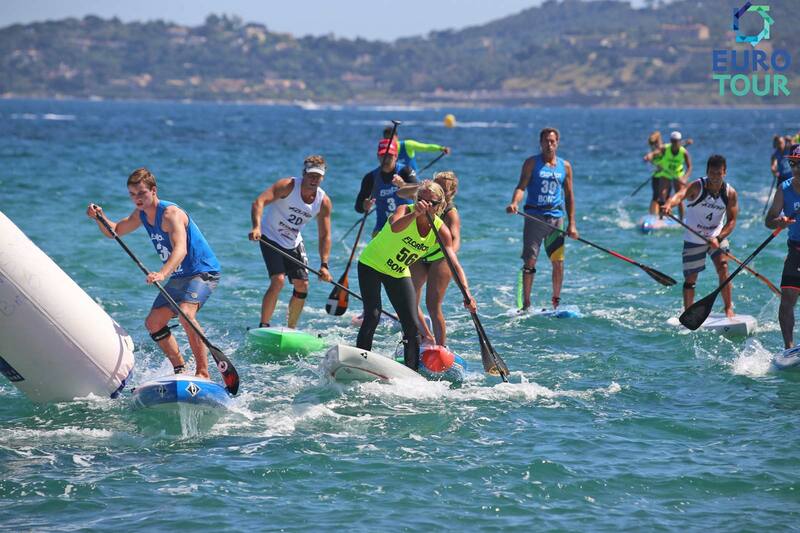 Connor outlasted Titouan Puyo, Michael Booth, Daniel Hasulyo and Leo Nika around the 6km highly-technical course, while Sonni was too strong for Fiona Wylde, Olivia Piana, April Zilg and Susak Molinero. Under glorious blue skies and a blaring hot sun, the field of international and European elite charged around the windy, zig-zagging course of today’s “Beach Race” event. With dozens of top ranked athletes on the start line, this was always going to be a tough slog, and the top men and women didn’t disappoint. After a false start due to a bunch of paddlers creeping over the line, the pace off the beach was very quick on the restart. 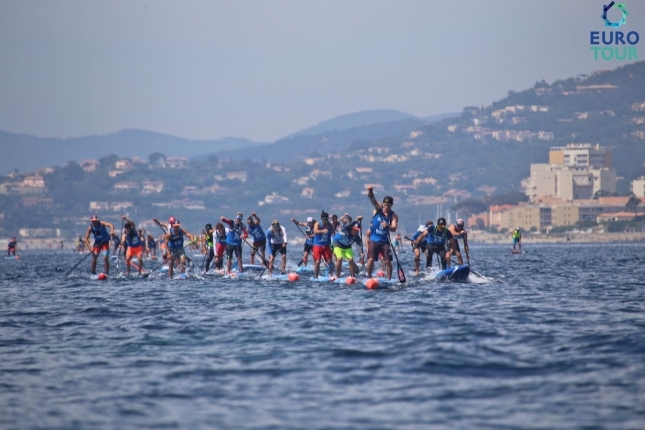 The 70 odd elite paddlers charged out towards the first buoy, which sat 250m off the shore of St. Maxime facing off across the bay at the glamorous St. Tropez, where we could see the famous hundred-million-dollar super yachts lined up. But the craft of choice today were 14′ stand up paddleboards, particularly the red tipped blue boards from Starboard, with Connor, Boothy, Beau O’Brian, Daniel and Leo the first five guys to whip around the golden buoy and set the early pace. Though quickly moving through the field to the front was Titouan from Teams NSP and Quickblade, the hero of last month’s Carolina Cup and one of the favourites for the 2016 EuroTour title. Titou had a sluggish start but, rather amazingly, was up alongside Connor and Boothy by just the second buoy. With a stiff afternoon seabreeze whipping up plenty of bumps, it didn’t take long for gaps to open up the field. The race organisers made last-minute adjustments to the course to provide more downwind sections, and the top ocean guys such as Connor and Titouan took full advantage. But sticking with them like glue was Aussie dark horse Michael Booth, who continues to show why he’s been given the hyped up title of “World’s Number One Dark Horse” in season 2016. The elder Hasulyo, Daniel, was immensely impressive and held on for the first lap and a half to make it a four-man contest – the very talented Hasulyo bros are getting better and better with every race. Boothy was very strong should have been there right to the finish, but the Aussie champ lost ground on Connor and Titou after falling at the start of the third and final lap. While the large chase group and mid-packs enjoyed engaging battles all the way to the finish, out front it was a two-horse race for the entire final lap, with Connor eventually pulling clear over the final 500 metres to claim the bragging rights on day one. However the world number one will have to play defense tomorrow; The SUP Race Cup here in St. Maxime is based on combined times from Day 1 and Day 2, so Titou and the other top contenders have a chance to make up the seconds over tomorrow’s 15km course. Although the race went for close to three quarters of an hour, the pace was fast the whole way, particular as the top contenders milked every last bump for all it was worth. It was a great contest and, as Connor quoted post-race, a fun course that made good use of the conditions. Outside the top five, others to impress included the junior Hasulyo brother, Bruno, as well as dark horse Italians Paolo Marconi and Giordano Capparella. Aussie/Kiwi Trevor Tunnington showed good form in patches but was hurt by a poor start, a similar story for 11th placed Martin Letourneur, who was racing a 12’6 against the bigger 14 footers and had to cleverly work his way back through the field after a horror opening stretch. However one of the best results came from a rejuvenated Eric Terrien, who looked close to retirement last season but has found a new lease on life in season 2016. Eric seems to be enjoying his racing more than ever, which is reflected by the BIC team rider’s strong result today. On the women’s side it was a very close contest early between Sonni and Fiona, however the powerful German, who currently holds both the Molokai and OluKai crowns, was unstoppable whenever the bumps weren’t straight downwind, slowly but surely pulling clear to win by more than a minute. Fiona was impressive in second, particularly on the several mini downwind sections where the Hood River local put her downwinding expertise to good use. Though not far behind Fiona was her Starboard team mate and home country hope, Olivia Piana, who has returned to the elite racing scene after 18 months on the sidelines. 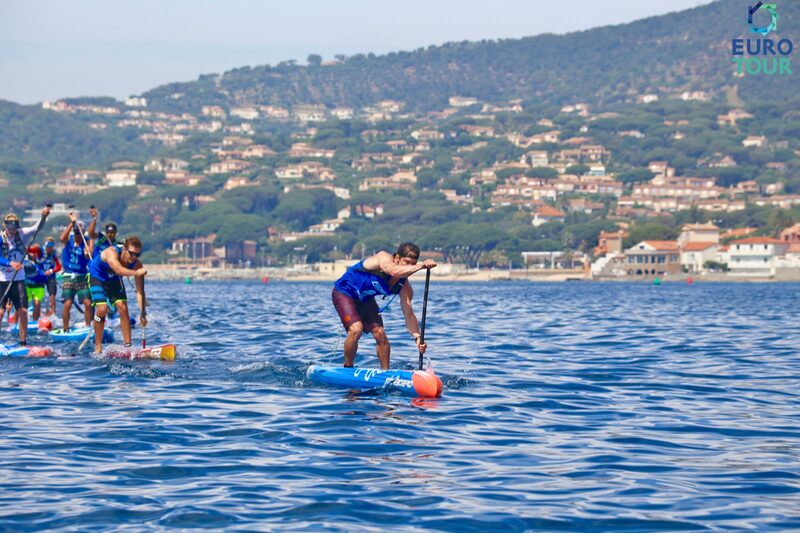 Olivia is the former Queen of French SUP racing and is clearly keen to get back on top, showing very strong form today. Also impressing today was April Zilg from North Carolina, who powered all the way around the course alongside Spain’s Susak Molinero. The two women sprinted towards the beach in the race for the #4 spot, but April just had the edge; Susak sealed the result when she jumped off in head high water that forced her to swim the final few metres to the sand, however the RRD team rider showed more than enough promise to signal a big summer ahead. 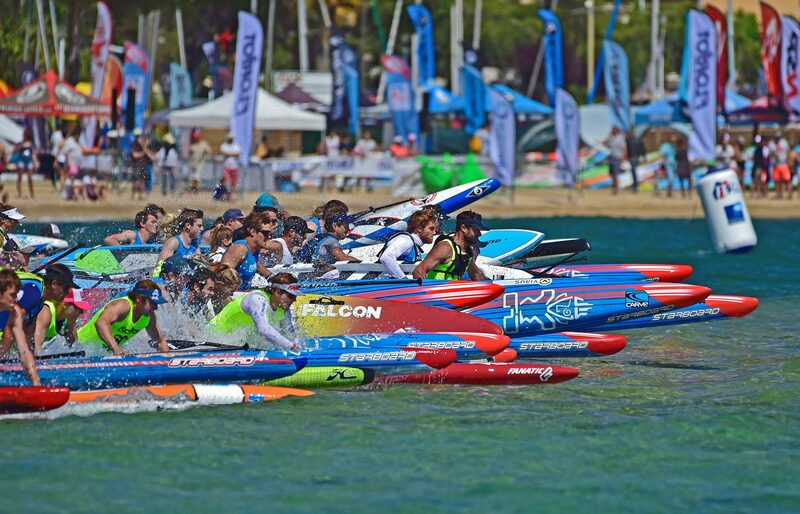 Mistral’s Seychelle Hattingh, the 24 hour distance paddling world record holder from Florida, looked strong in finishing 6th, while Slovenia’s Manca Notar was in top five contention early before retiring injured at the end of the first lap (waiting to find out specifics). Special mention goes to 14-year-old Lexi Alston from southern California, who held her nerve around the tricky and technical course to open her account on the 2016 EuroTour. Personally I had a great view from the boat out in the middle of the course, where I was piping through the ‘Starboard Live Stream’ from start to finish. If you tuned in, hopefully it gave you a nice little window into the action, and if you missed it you can watch the replay below (apologies for the shaky first few minutes!). Anonym SUP grabbed a nice little Facebook Live clip of the start, which clearly shows how bumpy the conditions were. Look out for the full and official EuroTour highlights reel on Monday. The SUP Race Cup continues tomorrow with the long distance race, which will help determine the overall event standings and the points on offer for both the EuroTour and SUP Racer World Rankings leaderboards. We’ll have the “Starboard Live Stream” running again on our Facebook page from 10:30am local time, so join us then for the conclusion to Week 3 of the EuroTour. You can also check out the full photo gallery of day 1 right here.